DeWalt DCP580N : Hands-on review by Ash (our tool boffin). 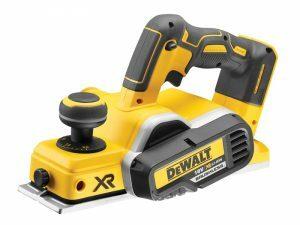 The DeWalt DCP580N – the low-down…. So, this weekend I finally got around to planing the bottom off a couple of doors at home using the new DeWalt DCP580N Planer. Needless to say, my ever-patient wife was very pleased. You know what it’s like – there never seem to be quite enough hours in the day… children, pets, work etc., and when you spend every day surrounded by the crème de la crème of power tools (hey – I’m not complaining – I’m a bloke after all), sometimes the last thing you want to do when you get home is pick up another. That said, we have DeWalt power tools on the site at the lowest prices ever at the moment so I bit the bullet and treated myself to the fantastic DeWalt Brushless Planer (the DCP580N, if you’re into model numbers). So, what’s it like? One word. WOW. This is a fantastic piece of kit. It has the power of a mains-powered machine but of course has all the convenience of a cordless unit. Well balanced, with a 2mm depth of cut and a 9mm rebate capacity. The brushless motor extends the tool life and the AirLock port deals with mess via either dust bag or extraction. 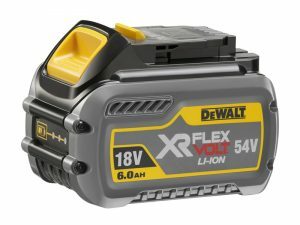 It’s also compatible with DeWalt’ XR Li-ion slide pack batteries, of which I have FAR too many, so that’s nice. The 2mm planing capacity soon got the job done, and I was once again back in Mrs Ash’s good books. This is quite simply a fantastic machine and I highly recommend it. Fancy treating yourself? Get yourself over to www.pamties.co.uk, where a huge array of DeWalt Power Tools are available at low prices.